Junior Joslyn Torres expresses her femininity while sharing a photo of herself before her transition. He sits in his garden, individually picking daisies from the damp soil, creating a crown of flowers in his ruffled hair. To him, flowers mean feminine and feminine feels right. Content and distracted, he fails to notice his grandmother coming up behind him, forcing him to take the flowers out. One by one she plucks the daisies and stomps them into the dirt. He looks down at the beautiful mess; his petals, femininity and happiness gone. Junior Josyln Torres always knew she was born in the wrong body, with male genitalia but with the mindset of a girl. When she was 9 years old, Torres had watched a documentary about transitioning from one gender to the other. She came to the realization that she was transgender and finally felt that being trans matched with how she felt. Growing up in an extremely religious family, Torres was scared of coming out because of the rejection she could have faced. 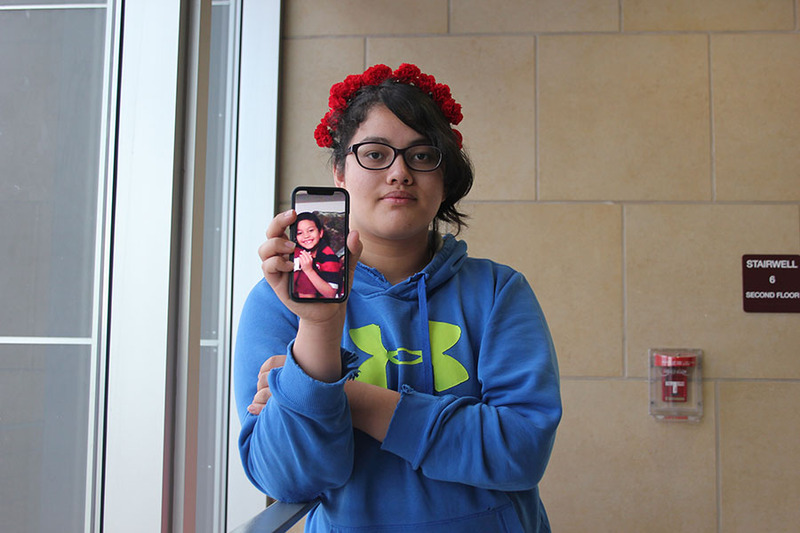 Until she was 13, Torres had been private about her transition; she officially came out when she was in the seventh grade at DeLay Middle School (DMS). Although Torres was ecstatic to have finally found her true self, she lost several close friendships and even relationships with her family. Day after day she’d be tormented at school and at home for being different which led to her falling into a deep depression. Throughout it all, junior Lillian Chambliss, who is also an ally of the LGBTQ+ community, has remained faithful and supportive of her friend for over five years; Chambliss has been there for Torres since before her transition. Regardless of all the harsh words thrown Torres’ way, Chambliss always finds a way to provide moral support and comfort. Although Torres handles negativity well according to Chambliss, it still upsets her knowing that Torres has to deal with all the backlash. Chambliss tries her best to comfort Torres in any way she can. Apart from losing friendships, Torres also received negative reactions from close family members. Before coming out to her mother, Torres was scared she would not be accepted but it was her mother, Teresa Alpizar, that has been the most supportive of her transition. Alpizar made sure Torres knew it was going to be a difficult transition, but that she’d love her regardless of her choice and help her in any way she could, including with all the negative reactions made by family members. Transgender or not, Aplizar’s love for Torres knows no limit. Accepting Torres wasn’t hard but it was frustrating whenever Torres would feel depressed, according to Alpizar. Though the future is uncertain, Torres would like to receive feminizing hormone therapy, which is a hormone therapy replacing the secondary sexual characteristics from masculine to feminine, by the time she turns 20. She is also working on legally changing her name from Jose to Josyln. Although society is evolving with more resources available for trans people, Torres feels humanity should become more open minded. This story was originally published on Farmers’ Harvest on December 18, 2018.